Clocked at 350 km/h at Nardo in Italy, it was for a time the world's fastest production car before being unseated by the one and only McLaren F1, which still holds the crown today. It’s resume reads; capable of hitting 100 km/h from rest in just 3.6 secs (faster than the F1), the first 500+ horsepower production car - more than the Ferrari F40, Porsche 959, Lamborghini Diablo and Bugatti EB110 and the lap record holder for a production model at the Nürburgring for almost a decade. 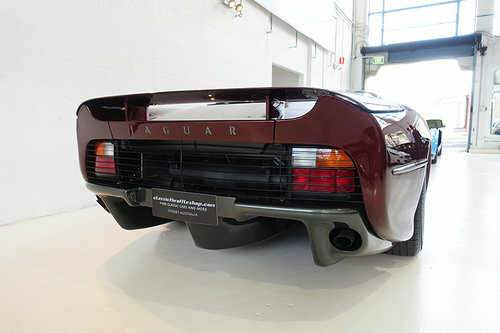 It was achieved thanks to experience gained from Jaguar’s double Le Mans winning Group C sports racers, its Cosworth-designed 542hp, 475lb.-ft mountain of torque producing 3.5 litre twin turbo charged V6 engine and uber slippery bodywork. 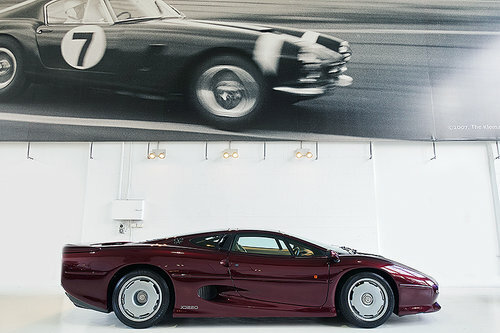 Produced by the Racing and Development division of Jaguar Cars Ltd from 1992-1994, the Jaguar XJ220 is one of the most undervalued supercars of its generation and still carries a rare air of mystery around its remarkable feats. Just 271 were ever produced with miniscule 69 cars leaving the factory in right hand drive at a cost of £470,000.00 each, making it one of the least common supercars ever to grace our roads. 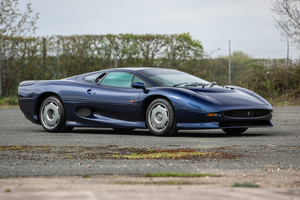 The car offered, is a 1993 Jaguar XJ220 ordered in Monza Red over Sand Connelly leather trim in right hand drive and has travelled just 904 miles since its delivery through Grange Jaguar, UK. One of the least driven examples of one of the rarest supercars in the world. In out of the box, original condition this XJ220 was serviced by the Aston Martin Works Service centre at Newport Pagnell in 2003 under the direction of the original owner shortly before arriving in Australia as part of a private collection. More recently, in 2015 the car was subject to a major engine and transmission service with one of Australia’s leading motorsport specialists, excellently prepared for its next custodian. 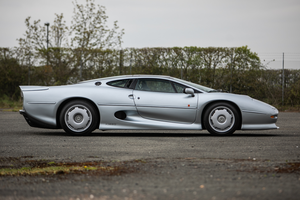 Accompanying this XJ220 is the original set of leather bound, silver gilded paperback manuals in mint condition both original Jaguar stamped keys and modern service receipts. 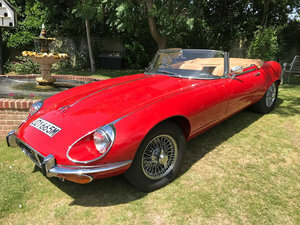 A time-machine in every sense of the phrase and an absolute landmark car within the history of the automobile and one of the most revered sportscar manufacturers, this face peelingly fast car is actually extraordinarily comfortable. It’s quieter than you’d think, deft riding, and civilised. A living, breathing, three dimensional model of Jaguar’s “grace with pace” motto. The aesthetic however, is all for the driver. 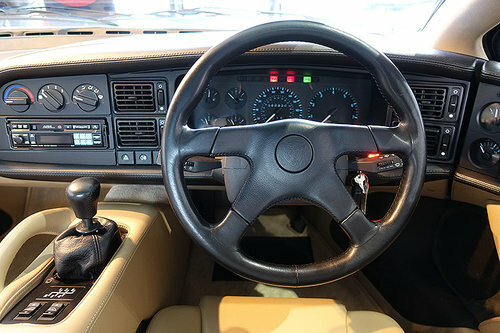 The XJ220’s interior houses more instruments than a spitfire. 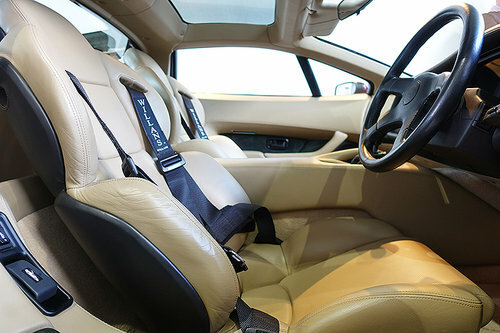 An analogue clock, turbo boost pressure gauge, ammeter and a gearbox oil temperature gauge to name a few and as the sports bucket seats and Willans racing harness clasp you perfectly you can’t help but feel you’re preparing for launch each time you step inside. And, the Keith Helfet penned bodywork is nothing short of Le Mans spec. All aluminium panels and a very slim drag co-efficient of just 0.36 means the XJ220 looks as though it’s travelling 300 km/h standing still. 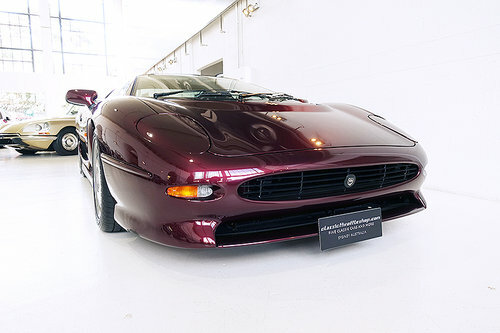 Exceedingly rare, one of the lowest mileage cars in existence presented in original condition and internationally undervalued with prices poised to move this Jaguar XJ220 is something extraordinarily special.